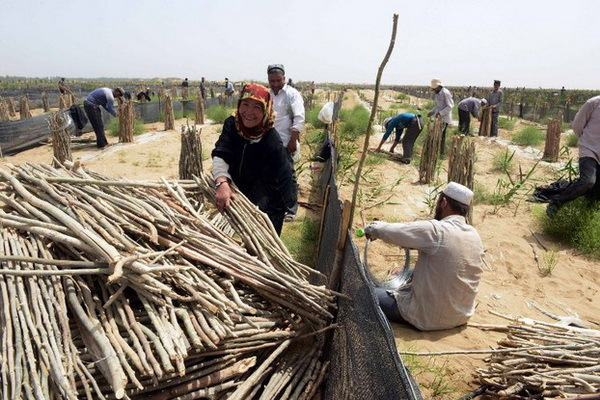 Authorities have arrested three Uyghurs who they say resisted and assaulted public officers sent to expropriate their farmland for a market in northwestern China’s Xinjiang Uyghur Autonomous Region, according to local sources. Farmer Mettohti Imin, his teenage son Abdusalam Mettohti, and a family friend were taken into custody in late March after confronting “more than 100 police officers” who had come to seize land communally owned by Aktash village in Xinjiang’s Laskuy township, a resident told RFA’s Uyghur Service. Local officials said they planned to turn the 600-mu (100-acre) plot—two thirds of which were being used by the 80 families of Aktash village to grow wheat—into a marketplace for produce and construction materials. When the boy tried to intervene, police officers began beating him as well, he said. “When Abdusalam’s father Mettohti Imin picked up his badly beaten son, the back of his head accidentally hit a police officer in the face,” the resident said. According to the Aktash villager, police arrested the three men for “obstructing and assaulting a public officer,” adding that the police officer had not been injured in the incident. As of April 5, the three men had been held for more than 10 days and their whereabouts were unknown, he said. Residents of Aktash said they had no prior knowledge that the local government planned to turn their farmland into a market and were completely surprised when security personnel showed up at their village in late March. They said that the local land office had measured off an additional 1,200 mu (200 acres) of area farmland a few months earlier, but residents were never told what the government planned to use that for either. When contacted about the dispute in Aktash, a Uyghur staff member of the Hotan city land administration office, which oversees land management in Laskuy township, said that the expropriation had been ordered by the village government. The staff member, who did not give his name, confirmed that the village government planned to turn the site into a marketplace. RFA contacted Xiu Jianhua on Friday, who said he didn’t want to answer any questions related to the issue. “If you want more information, contact the regional government and Hotan city government. They know what I am going to do with the land,” he said. The Aktash villager said that he and his fellow farmers had petitioned the regional government after the March standoff, with little results. “We went to the regional land administration office and we went to the regional petitioning office, and neither took our side. But we didn’t give up,” he said. But he said that not only was the land too far away from Aktash, the neighboring village had never agreed to give up their land in the first place. The villager said that the residents of Aktash have run out of options. “We don’t know what to do. If we act against them, they arrest us. If we don’t do anything, they will take over our land,” he said.